This pattern uses oddments of 4 ply yarn and uses 2.75 mm needles. My tension works out to 8 stitches and 10 rows per inch. 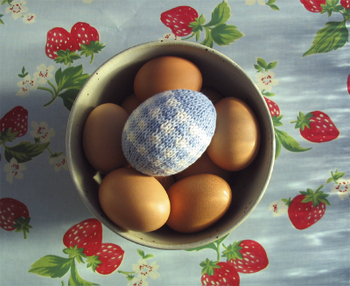 The egg is knitted flat and then seamed using mattress stitch. You can stuff the finished egg with polyfil / wool / cotton wadding or it will fit around a polystyrene egg. Row 11: Change to yarn color for pattern band - work chosen pattern band over the next 12 rows (see charts below for pattern suggestions) or simply use a contrasting color for middle 12 rows. Cut the work from the yarn leaving an end around 6 inches long, thread end through stitches on needle and pull up tight. Use this end to begin sewing up the seam. Sew around 1 inch of seam and then begin seaming at other end of egg. 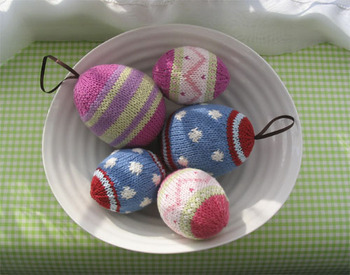 If you want to hang the egg as a decoration then cut a length of ribbon and tie the ends together. Thread the loop through the gathered stitches at the pointed end of the egg leaving the knotted part inside. At the other end of the egg thread the length of yarn left by the cast on and use to catch up the 11 stitch loops and up pull tight. Continue in mattress stitch to close the seam - leaving around 2 inches of unclosed seam to stuff the egg (if using polyfil or similar). If you are fitting it around a polystyrene egg just sew around half an inch of seam at either end and close the rest of the seam with the polystyrene egg in place. When the seams meet tie off ends and thread inside trimming off any excess ends.